I'm not a huge fan of old Volvos, but I have more than a few friends who love them. One of them has an old 144 with over 300,000 miles on it. He uses it everyday. He claims the engine has never been apart. I respect that. Me? I'd rather have something that needs a little work from time to time, but is a little more exciting. For some reason though, I've always liked the 164. It's really not a whole lot different from my friend's 144. It was Volvo's attempt to move the line a bit upmarket. Instead of the 4 cylinder engine found in the 144, the 164 got an inline 3.0 liter 6 (not the PRV V6). Inside, the car got some more "luxurious" seats (available in leather) and a few other amenities not found in the 144. It's almost laughable now to look at the dashboard and think that it was Volvo's idea of "upmarket". A strip speedo, some fake wood and a radio that would be tough to adjust without having a passenger on board. Ergonomics was an unheard of concept in 1970. The exterior is much better. From the A-pillar back, it's pretty much standard 144. It has Volvo's distinctive, purposeful, squared off look. It's not an exciting look, but it represented what Volvo was back then; a serious, safe, comfortable car. Sportiness and style were not part of the equation. From the A-pillar forward, things were different. Everything was longer to accommodate the 6 cylinder engine. The nose was completely different. Volvo was very obviously looking at a Vanden Plas when designing the nose, but it worked. It's that nose that attracted me to the car. 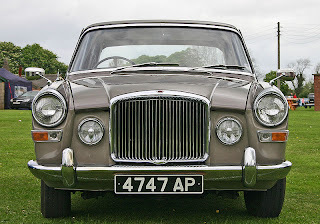 Vanden Plas Princess 4 Liter front end. The car being offered on eBay is a low mileage example being sold by a Volvo restoration shop in Houston, TX. The seller descibes it as a " fly in and drive home car". It does not have air conditioning, so you might want to wait until the fall to drive it home from Houston... Click here to see the eBay listing. Hahahaa.... great stuff I grew up on Volvos, probably 20 of them between my sister father uncle and me. I will never forget dad's '67 144 with the snaked exhaust out the back left side, skinny-assed tyres and the brakes that I would help him do ourselves, out in the garage when I was 7 or 8 years old. It was traded in on an orange '74 with the funky striped seats with the brown and orange black (no blue). Then a '79. Then an '84. Then a 940. Then an S70.... and now he drives VW.